When she burst onto the world stage in the 1980s, no-one could have predicted how she would depart it in the 21st century. But Whitney Houston’s career truly was meteoric: she blazed to fame, burned her way across the sky, and vanished into darkness in all too brief a space of time. It was four years ago this month that she was discovered dead in her hotel room in Beverley Hills, California. She had drowned in the bath, weakened by heart disease and general ill-health. It was an old person’s death, but Whitney was only 48 and should have enjoyed decades more at the top of the entertainment business. The explanation for her premature death is simple: she had become addicted to drugs, and cocaine in particular. That would have seemed almost impossible at the beginning of her career, when she was remarkable for her radiant beauty and good behaviour. And for her remarkable voice, of course: it was powerful but effortless, passionate but melodic. She could have sung the telephone directory and made it sound good. She chose much better material than that: she had an excellent ear for songs, helped by both her ancestry and her upbringing. She had been preparing for a musical career almost since her birth to a middle-class black couple in Newark, New Jersey, in 1963. Her mother Emily was a gospel singer and her father John worked in the entertainment business. Two big music stars were close to the Houston family: Dionne Warwick was a cousin and Aretha Franklin was a good friend. Warwick and Franklin had both enjoyed long careers, and Whitney seemed ready to follow their example. She sang in a gospel choir at a Baptist Church in Newark, then joined her mother on stage as a back-up singer during her teens. She also worked as a model, gracing the pages of teen and fashion magazines. It seemed perfect preparation for an attempt at stardom: she was used to public appearances and had carefully honed her musical craft, familiarizing herself with several genres and carefully observing her mother and other female performers. Her hard work paid off. After signing with the record company Arista, she rose to international stardom after the release of her self-titled debut album in 1985. Today that album alone is estimated to have sold 25 million copies around the world. Comparisons with the similarly mega-selling Michael Jackson are inevitable. Like Whitney, Jackson enjoyed huge success at an early age and seems to have been doomed by it. Once they became stars, neither of them could ever lead an ordinary life again. Both were drawn into drug abuse, both slowly lost their good looks, both became increasingly unhealthy. And both died because of it, Jackson in 2009 and Whitney in 2012. Jackson seems never to have recovered from the traumas of his childhood, when his father ruthlessly drilled him and his brothers for performance. Whitney didn’t have an unhappy childhood like that, but her once shiny image became tarnished after she married a singer called Bobby Brown in 1992. She was no longer the consummate professional or the radiant beauty: she was late for performances and interviews and began to lose weight. Rumours circulated that she and Brown were taking drugs together. Unfortunately, the rumours were true. 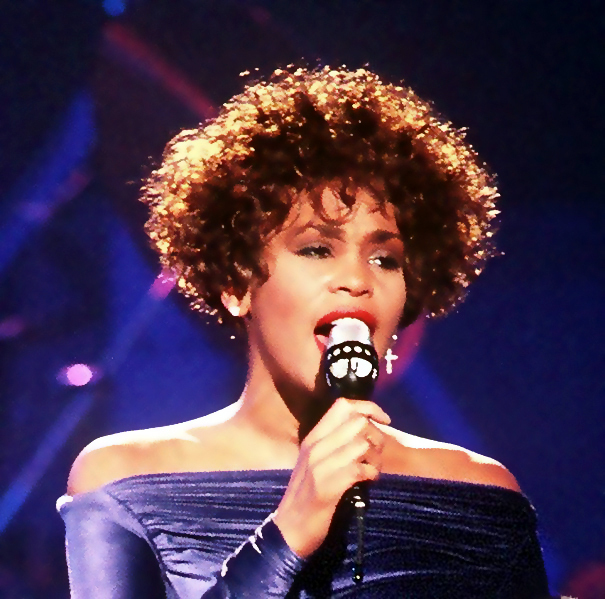 However, the couple divorced in 2006 and Whitney’s career began to recover. She had another number one US album with I Look to You in 2009, but she was dogged by negative reviews of her live performances and it was clear that the effortless grace of her heyday in the 1980s and early ’90s was gone for good. She was still a superstar, but her past looked bigger than her future. Then came the news, in February 2012, that her future was over: she had passed away in the saddest of circumstances. The meteor that had once blazed across the sky had been extinguished. But nothing will ever dim the memory of her early years at the top and her music will continue to attract new fans, retain old ones, and inspire and influence other performers. Like Michael Jackson, Whitney Houston was a star whose like will never be seen again: the entertainment business has become too diverse, has splintered into too many niches and specialist interests. No-one can dominate the scene as those two once did and no-one will challenge their place at the very top of the musical tree. It’s a small consolation for a massive loss.